The rush to fill supply lists and update fall wardrobes is complete for many children across Idaho who are bidding farewell to summer vacation and hello to school classmates. As the annual pilgrimage back to school hits full stride, motorists and children are encouraged to make safety their highest priority. Traffic surges around schools in late August and early September, bringing increased risk of crashes involving cars, bicycles and pedestrians. ITD recommends that children walk to school if they live within a reasonable distance and if they can do so safely. The added daily physical activity promotes good health, reduces congestion, improves air quality and saves natural resources while teaching children important traffic safety skills. The National Safety Council also suggests that parents review with their children the correct way to cross a street. Motorists should be keenly aware of the risks that accompany the reopening of schools as more children use sidewalks and bicycle paths. But drivers also need to watch for buses transporting children to and from schools in the morning and afternoon. Buses sometimes stop in travel lanes, requiring approaching vehicles to slow or stop. The Idaho Transportation Board approved funding additional highway construction projects with savings realized from the eight original projects. The new projects were announced during the board's Aug. 20 business meeting in Rigby. More than $50 million in bid savings emerged from the stimulus projects advertised this spring. The first phase of development for the Timmerman to Ketchum corridor is set to begin. A consulting firm has been selected to design and provide construction plans for the initial project. WH Pacific, an Idaho-based engineering and land surveying firm, was chosen from a group of 13 candidates to develop right-of-way plans and design the first phase of the 26-mile corridor reconstruction project. Since the June workshop, ITD staff members have been refining the FY11 draft budget request in accordance with instructions from the Division of Financial Management. Very few changes were made to the final budget draft that was presented to the board, and approved, at its Aug. 20 meeting in Rigby. The budget now goes to the Division of Financial Management and Legislative Services Office. A favorite uncle. A fierce competitor. A friend closer than any brother. An inspiration who never missed an opportunity to sing, to laugh or to help someone in need. Such was the tribute Monday to longtime Lewiston businessman and legislator Bruce Sweeney, who died last week at the age of 77. On Monday, family and friends gathered to mourn the passing of Bruce Sweeney, one of Idaho's great statesmen. The services were held in Lewiston, but Idahoans in every corner of our state joined in mourning the loss of this exemplary man ... Sweeney's passing should remind us all not only of the foundational principles of our government, but also of the need to do our part. His life is a remarkable example of full and active participation. As Idaho car buyers scrambled to take advantage of a federal incentive program and automobile dealers braced for the wave of last-minute transactions ITD worked behind the scenes to help expedite providing registration verification for submittal of requirements by dealers. Division of Motor Vehicles staff in Boise worked through the weekend to help buyers beat the Monday (Aug. 24) “Cash for Clunkers” deadline. Every September through November, benefited employees have the opportunity to purchase supplemental insurance from American Administrative Group, Inc. The plan is called NCPERS Voluntary Group Life Plan and is underwritten by Prudential Insurance Company. ITD will implement new standards for passwords on Jan. 4, 2010, to bring the department into compliance with the Information Technology Resource Management Council’s (ITRMC) policies and guidelines related to user and system passwords. The change also supports the governor’s consolidated services initiative for information technology, explains Forrest Anderson, ITD’s cyber security officer. A new vision of mobility in Idaho has a new Web site where people can identify convenient, cost-effective and green mobility and public transportation options. Mobilityidaho.org offers visitors information about and participate in the design and management of Idaho’s evolving efforts to move people from place to place by using a mix of transportation modes. When Brian Poole, D-5 assistant district engineer, wanted to rise above the stress of his work world, he looked for a mountaintop experience. He found it on the top of Grand Teton, elevation 13,771 feet. Poole joined a couple of other adventurers on a guided trip to the summit early this month. The five made it to the Enclosure, a ridge on the north face of the rugged peak. 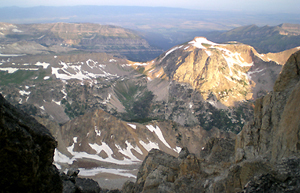 The photo of Poole shows him with the summit in the background. The accompanying photo of Poole and his climbing partners was taken at the Enclosure at about elevation 13,250 feet. Please share information about your accomplishments or those of your colleagues with the ITD community. Send contributions to The Transporter. The transportation board Thursday selected member Neil Miller, District-5, Blackfoot, to succeed Mr. Sweeney as board vice-chairman.